Posted by janina on February 26, 2009 at 5:11 pm. Recently Mark Bittman wrote about savory breakfasts as part of his quest to shift diets from meat, fat, and sugar heavy foods to fresh vegetables, grains, and legumes. Patrick got extremly excited about the idea, especially since we had just made a bunch of polenta and black lentils for dinner that week, and decided to make a breakfast with the left overs. I found this extremely funny, and pointed out that I had been serving him an identicle breakfast for several years now. So to remind him, and to tribute Mark Bittman’s quest, I decided to put it on the menu for this week. 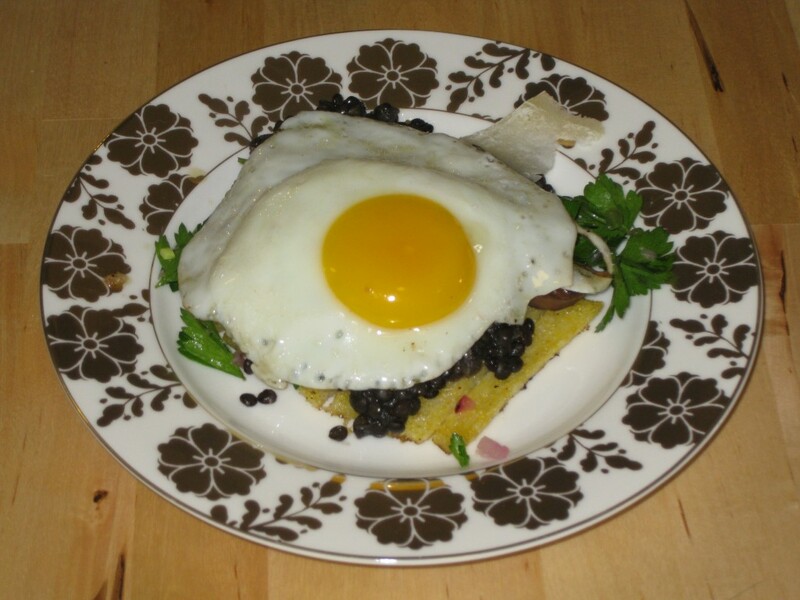 This dish at its simplest is broiled polenta and black lentils topped with a little cheese and an egg, but it’s easy to spruce it up a bit for company with something inspiring like Felicia and Kelly’s Parsley salad. It’s also something you can make in a huge batch and store for the rest of week as a quick breakfast in the morning, or lunch in the afternoon, or base for dinners and salads. It may be the most flexible meal I’ve encountered. This recipe makes about 8 servings. 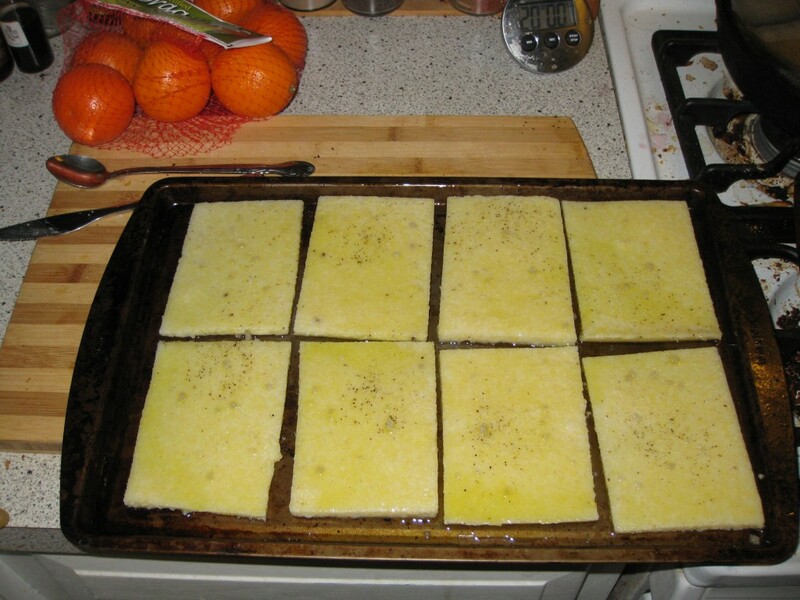 Before we get started, let me explain a little about baking/broiling polenta for anyone who hasn’t done it. Polenta thickens over time and becomes solid enough to cut, handle, and bake, but the texture will be consistent throughout. The longer you let it sit, the easier it will be to handle, I usually let it sit over night. When you bake it, you begin drawing the water out of the center and crisping the outside into a chewy skin. The longer it is in your oven, the chewier the outside becomes, and the thinner the inside becomes. So, depending on how you like your polenta, or how many people you need to accommodate, you can do this multiple ways. When I am making this for myself I prefer to cook the polenta on broil in the toaster oven for about a half hour. It gives it a thick skin and a soft thin inside. Last weekend, I baked it for about an hour in the oven while preparing other things which baked it almost all the way through, making it crisp and chewy, almost like a sort of salty bread. You can also broil it, creating a quick skin on the top while saving the a good portion of the soft interior. This last method is usually best, though not very energy efficient if you are just making a single serving, and not very effective if you are making 16. If you plan to bake it for a long time, and make it SUPER chewy, I suggest cutting it into half inch strips to make it more manageable to eat. I did not, and I think it was difficult for people to get at while eating on their laps and trying to have easy conversations. Polenta layed out ready to bake. bake according to taste: broil for 5-10 minutes in your oven’s broiler, or individually for 30 minutes in a toaster oven broiler, or bake all at once at 425 for 40 minutes or until crispy. This is a very simple way to quickly cook some lentils as a side dish instead of a soup. 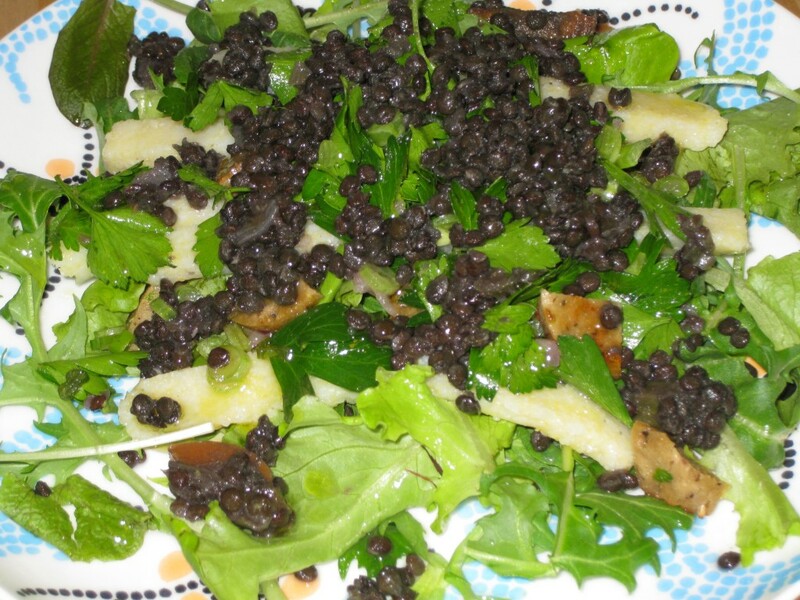 The resulting dry, firm, lentils add a wonderful textural experience to any dish, while the flavor of black lentils is adds the classic peppery taste. You can add any vegetables you find your refrigerator, but I recommend at least adding 1/2 an onion and 2 carrots. This salsa was inspired by Felicia’s video at Meal Ticket. That parsley salad looked delicious I wanted to try something similar, and I was definitely rewarded. It turns out, parsley is an excellent compliment to a hot dish! It doesn’t wilt when sandwiched between hot foods, and the flavor is both subtle and distinct. I might have found a new favorite. Again I have to admit I am not much of a baker, though I recently realized part of the problem is my oven which likes to heat irregularly. Because of this, I’m not going to include a pound cake recipe. I was unimpressed with the one I used, and can’t think of any additions to make it better. 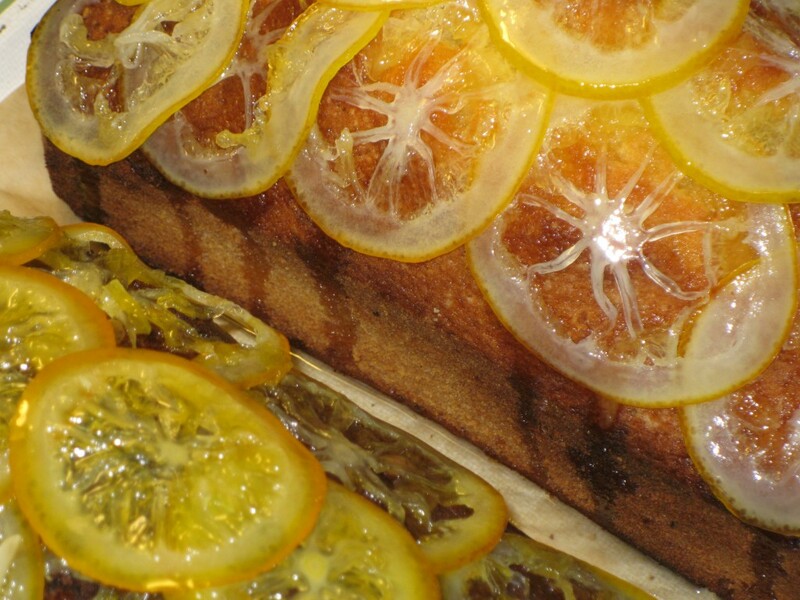 BUT, I am happy to share my experience with candied citrus, and the trick to adding it to a pound cake instead of icing. if you plan to use it later, ladle it into a clean sanitized 8 oz jar, seal the lid and immediately invert the jar for 15 minutes. When you right the jar it should be safe to keep at room temperature for up to 18 months. Discard left over syrup, or save for drinks. On Monday I used a bunch of the left overs to make a salad with the greens Emily K. brought. On top of the bed of greens, I added strips of left over, unbaked polenta, cold leftover lentils, slices of her vegan sausages (which were unbelievably good), and some of the parsley salsa. I topped it with a little bit of lemon, salt, and olive oil, and let me tell you… it was the best most filling salad I have had in ages. I highly recommend trying any of these ingredients in your next salad.